Buy Bloomingdale’s gift cards online at a discount to save money on furniture, dresses, shoes, bedding and more from this high end retailer. Bloomingdale’s is a high-end department store that carries a wide selection. Fill your little brown bag with Bloomingdale’s shoes, jewelry, handbags and cosmetics during the Friends and Family sale or throughout the holidays and find gifts for everyone on your list. 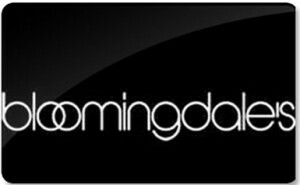 Shopping Tips: Bloomingdale’s gift cards do not expire, so buy a discounted gift card today to get great deals on designer clothing and accessories for your home and family. Below is a listing of our favorite places to buy Bloomingdale’s gift cards. There are always great deals and discount available when buying these so check back often. We will keep this list updated to reflect the best rates when possible. Put your best foot forward when you buy Bloomingdales gift cards at unbelievable discounts! Save on current trends in-store or online with fashion fit for the whole family and discounts on designer home furnishings. Read more on Gift Cards Discount Rates.